Sandburg Hall was constructed in two phases. The North, South and West towers were built in 1970, and were the first residence halls at UWM. East tower opened in 2000. Because of the difference in construction dates, East tower varies in many ways from the other towers. Sandburg Residence Hall is located at the intersection of Newport Avenue and Maryland Avenue – north of the UWM Golda Meir Library. North, South and West Towers are identical in suite and room layout. They differ only in number of floors. On floors 1-4 of all 3 towers, the configuration of the 10 and 20 suite may vary due to the connection to the Commons. Every floor contains eight suites, numbered 10 through 80, each containing three rooms, labeled A through C. For example, N2320B is in North tower, on the twenty-third floor, in the twenty suite, and is the middle room in that suite. There are several configurations of suites, each housing four or five people in single-, double-, or triple-occupancy rooms. 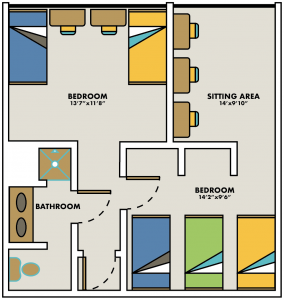 Suitemates share a private hallway and bathroom. Each resident’s room key also opens the door into the appropriate suite hallway. Certain suites and rooms are adaptable to meet the requirements of residents with special needs. Please complete the University Housing Room Accommodation Form available on the Forms & Publications page. 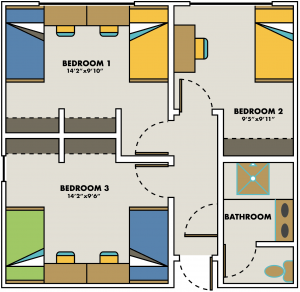 View the Sandburg Floor Plans PDF describing the different rooms. Every floor of East Tower contains six apartment-style suites, each housing six people in two single rooms, two double rooms, and a shared bath and kitchen. Each resident’s room key also opens the door into the appropriate suite hallway. A limited number of parking spaces are available in the parking garage. Visit www.uwm.edu/parking to view the rates and procedures to request a permit. Visitor parking is available in the metered spaces in the Sandburg garage. Daily permits are also available to purchase at the Service Desk. Tours of Cambridge Commons, RiverView, and Sandburg Traditional Towers (North, South, and West) occur on a predetermined schedule. Tours of Kenilworth Square Apartments, Purin Hall, and Sandburg East Tower, may be scheduled with at least 48 hours notice (subject to availability). To inquire about tour possibilities, contact the University Housing Student Outreach Assistants at (414) 229-3158 or uhmktg@uwm.edu.